It’s the High Holy Season in Texas, as we approach the anniversaries of the Alamo Battle, Goliad & San Jacinto battles. There will be much speech-making and newspaper & TV reports on the Alamo battle’s continuing significance, it’s story of sacrifice and revolt, it’s controversies. People will read Texian commander William B. Travis’ famous ‘To The People of Texas and All Americans In The World’ letter, announcing that the Alamo was besieged by a large force of the Mexican army and was in great need of help. It was a Romantic age and Travis, a prickly, prideful man was a person of his times. You feel that he spoke like Sir Walter Scott wrote, full of florid language, rich in drama and heavy with the weight of sacrifice and honor. It’s a hell of a letter. Many Texans can quote it from memory. But still, the one communique William B. Travis sent out from the Alamo that hits me most is his last, dated March 3, 1836. 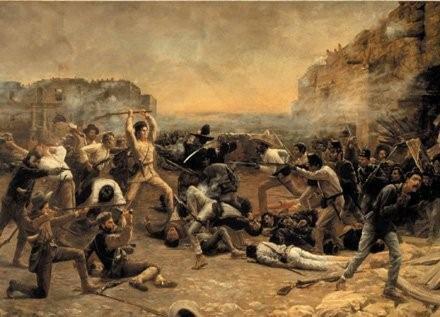 Three days later, as Mexican troops streamed across the Alamo’s battered walls, Travis died near the fiercest fighting. He was 26 years old.